POUGHKEEPSIE, N.Y. — Three of Marist College’s own sorority chapters; Sigma Sigma Sigma (Tri Sig, ΣΣΣ), Kappa Kappa Gamma (KKG, ΚΚγ), and Alpha Sigma Tau (AST, ΑΣΤ) have arranged ways to help those affected by both Hurricane Harvey and Hurricane Irma. University Tees, an online custom apparel business, specializes in adding sorority letters to custom designs. They recently designed two separate t-shirts, one for Texas and one for Florida. A percent of the profits goes directly to relief efforts in the areas hit by the storm. 15% of the sale price goes to those hit from Harvey and 100% to those hit from Irma. All of the profits go directly to the Red Cross. Both shirts are being sold at the sale price of $27. The site and sorority chapters’ team up to design a shirt that involves the sorority’s letters and the area or reason the shirt is being sold. The shirts are given a designated price and then a percent of those profits go to the organization(s) needing help. Live Sales Coordinator and Campus Manager for University Tees, Meghan Tinkham, confirmed they have raised over $12,000 so far and the number is rising, but that it is not the first time. “One thing I personally love about University Tees is that we have Philanthropy Donations and they will match whatever an order raises!” There has been an order for a sister that was assaulted and the money raised was donated to the organization No More. Another instance was in the chapter Tri Sig’s swap page where money was raised for The Wounded Warrior Project. 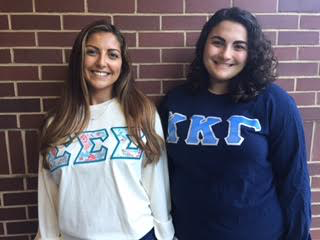 “I always buy regular shirts from them [University Tees], like for Big/Little reveal, or just for personal apparel with the Tri Sig letters on it,” said Marist College senior Katherine Raborg. The instant she saw the Harvey shirt on the chapters Facebook page she ordered one. She has been tracking her order since and is waiting its arrival. Currently it is being designed. The shirts picture the state outline of either Texas or Florida on the back with the saying “Texas Forever” or a decoration of oranges growing around the outline. The front features the letters of the chapter on the upper left hand side of the shirt either on a pocket or just the shirt itself. Cara Guerin, another senior at Marist College and sister of KKG ordered one of the Florida shirts in support of her Big sister, Kate Boylan. Boylan is from Florida originally and Hurricane Irma has affected the home of this alum of Marist College. KKG also has another program, which helps sisters in need. Besides buying shirts from University Tees they have the Rose McGill Aid foundation. This foundation is specifically for disaster relief and one sister, not from Marist applied due to the loss and damages she suffered from Hurricane Harvey. She is not alone. Marist is not known for having a large Greek life being there are only four recognized sororities and three recognized fraternities but the activity is largely present. They can usually be seen selling pizza or cupcakes on the Marist campus. Besides running fundraisers for their own chapter, they also raise money when weather disasters hit or sisters are in need. This entry was posted in Uncategorized, Weather and tagged Weather. Bookmark the permalink.